a full delegate registration to attend the AusBiotech 2018 conference, which will be held from Wednesday 31 October to Friday 2 November at the Brisbane Convention and Exhibition Centre, Southbank, Brisbane, Queensland. 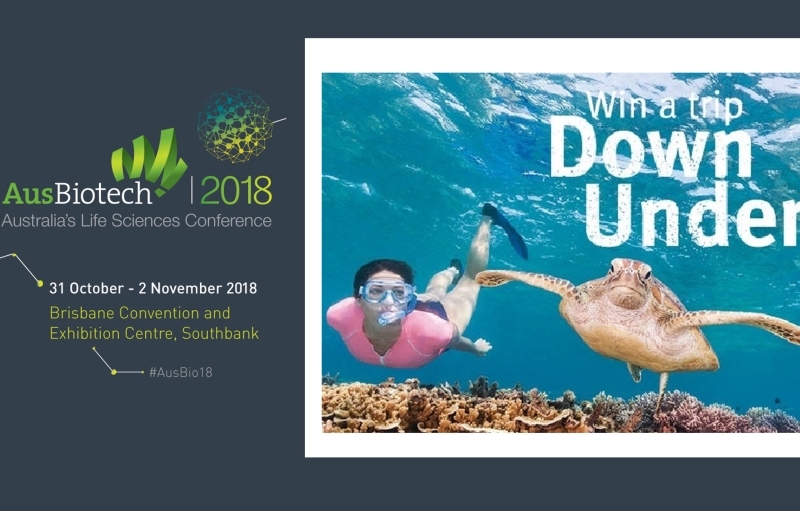 The annual AusBiotech conference has brought together Australian and international biotech leaders and stakeholders for more than three decades, creating a forum to reflect on the sector’s achievements and exchange ideas to further advance the sector’s standing both nationally and globally. AusBiotech is dedicated to consolidating this growth, and our 2018 conference will once again present issues critical to industry. Global biotech trends, breakthroughs, challenges and success stories will feature prominently on the program. Panel discussions and key themes will cover regulation and reimbursement, research translational strategies, new markets, business development and capital access, emerging technologies, clinical trials and commercialisation. Registration for AusBiotech 2018 is open. The AusBiotech National Conference 2018 is proudly sponsored by the Queensland Government’s Advance Queensland Initiative.